Are mysterious fast radio bursts coming from the collapse of strange star crusts? Any comments, suggestions or just looking for a chat about this subject? Don't hesitate and leave a comment on our improved comment section down below the article! Fast Radio Bursts (FBRs) have fascinated astronomers ever since the first one was detected in 2007. This event was named the “Lorimer Burst” after it discoverer, Duncan Lorimer from West Virginia University. In radio astronomy, this phenomenon refers to transient radio pulses coming from distant cosmological sources, which typically last a few milliseconds on average. Over two dozen events have been discovered since 2007 and scientists are still not sure what causes them – though theories range from exploding stars and black holes to pulsars and magnetars. However, according to a new study by a team of Chinese astronomers, FRBs may be linked to crusts forming around “strange stars”. According to a model they created, it is the collapse of these crusts that lead to high-energy bursts that can be seen light-years away. The study, titled “Fast Radio Bursts from the collapse of Strange Star Crusts“, recently appeared in The Astrophysical Journal. The team was led by Yue Zhang of the School of Astronomy and Space Science (SASC) at Nanjing University and included Jin-Jun Geng and Yong-Feng Huang – a postdoc and professor from the SASC and the Key Laboratory of Modern Astronomy and Astrophysics (also at Nanjing University), respectively. As they state in their study, all previous attempts to explain FRBs have been unable to resolve where these strange phenomena come from. What’s more, no counterparts in other wavebands have been detected for non-repeating FRBs so far and research into their origins has been confounded by the study of repeating FRBs. This is due to the fact that the former are often attributed to catastrophic events, which are incapable of repeating. “It has been conjectured that strange quark matter (SQM), a kind of dense material composed of approximately equal numbers of up, down, and strange quarks, may have a lower energy per baryon than ordinary nuclear matter (such as 56 Fe) so that it may be the true ground state of hadronic matter. 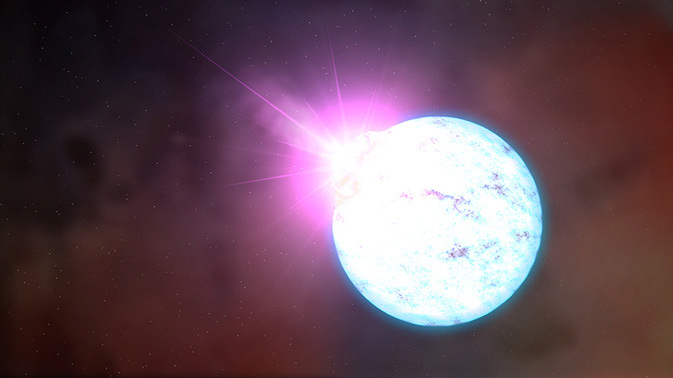 If this hypothesis is correct, then neutron stars (NSs) may actually be ‘strange stars'”. According to this model, strange stars build up a layer of hadronic (aka. “normal”) matter on their surface over time. As these SQM stars accrete matter from their environment, their crusts becomes heavier and heavier. Eventually, this leads the crust to collapse, leaving a hot and bare strange star that becomes a powerful source of electrons and positron pairs. These pairs would then be released along with large amounts of magnetic energy over a very short timescale. The team further hypothesized that during a collapse, a fraction of magnetic energy would be transferred to the polar cap region of the SQM stars, where the magnetic field energy is released. This would cause the electrons and positrons to be accelerated to ultra-relativistic speeds, which would then expand along magnetic field lines to form a shell. Beyond a certain distance from the star, coherent emission in radio bands will be produced, giving birth to an FRB event. They also theorize that this same phenomenon could give to rise to repeating FRBs. One possibility is that the crust of an SQM star could be reconstructed over time, thus allowing for repeated events. A second is that only small sections of crust collapse at any given time, thus resulting in repeated events. Owing to this long reconstruction timescale, multiple FRB events from the same source seem not likely to happen in our scenario. Our model thus is more suitable for explaining the non- repeating FRBs… However, we should also note that during the collapse process, if only a small portion (in the polar cap region) of the crust falls onto the SQM core while the other portion of the crust remains stable, then the rebuilt timescale for the crust can be markedly reduced and repeating FRBs would still be possible. Another thing that they claim will require further investigation is whether or not the collapse of a strange star’s crust could result in electromagnetic radiation other than radio waves. At present, any emissions in the X-ray and Gamma-ray bands would be too faint for current detectors to observe. For these reasons, further investigations of FRB sources with more sensitive instruments are needed. These include the Canadian Hydrogen Intensity Mapping Experiment(CHIME) telescope – located in Penticton, British Columbia – and the Square Kilometer Array (SQA) currently under construction in South Africa and Australia. These facilities, which are optimized for radio astronomy, are expected to reveal a great deal more about FRBs and other mysterious cosmic phenomena.